This concept has been running through my head very often recently, and I'd really love to share with you guys this yogic teaching of Non-attachment. In Sanskrit, it’s called Aparigraha – also the fifth Yama or simplistically one of the teachings in the 8 Limbs of Yoga. 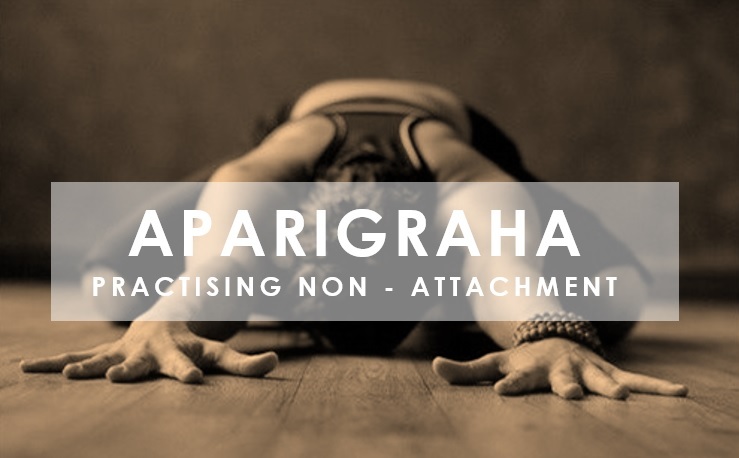 Aparigraha often translates as ‘non-greed’, ‘non-possessiveness’, and ‘non-attachment’. It teaches us to take only what we need, keep only what serves us in the moment, and to let go when the time is right. Aparigraha is one of the central teachings in the Yogic text the Bhagavad Gita, in which one of the teachings that could perhaps be the most important lesson of all to learn: ‘Let your concern be with action alone, and never with the fruits of action. Do not let the results of action be your motive, and do not be attached to inaction’. What it means, is that we should never concern ourselves with the outcome of a situation, we should only concern ourselves with what we’re actually doing right now as we work towards that outcome. What are the things we as humans are attached to? We are attached to results, memories, relationships, things that make us feel good. Well, you might ask, what’s wrong with being attached to things or people that make us feel good? Or striving for results or achievements. Nothing’s wrong absolutely. It does not mean that we stop working hard, or stop setting goals, because we need all these in life to keep us driven, to feel purposeful, to love and feel loved, that’s how we humans are programmed to function daily. But truth is, it indeed is such a fine line that it’s hard to grasp. The problems arise when the attachment reaches an extent that causes disappointment or misery to ourselves. How about when our attachment to a wonderful past experience makes us reluctant to try something new, and becomes an obstacle to our growth? Case in point – take a pause now for just a few moments and think of maybe just one recent happening when you have felt depressed or upset, is it due to an over-attachment to something? Would you have felt better or easier if you have just let that go? Over the years, I have come to realise that life is 80% about letting go, letting go and letting go. Maybe right now, you may not be able to relate fully to this concept. But keep this close to your heart, so it will be right there when you need it. Read this article on Ekhart Yoga that discusses how we can cultivate non-attachment on and off the mat. Older PostYoga Philosophy 101: What are the 8 Limbs of Yoga?